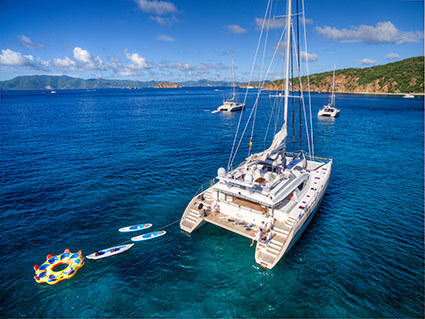 A BVI tandem yacht charter makes a one of a kind choice for a large family group, multiple couples group, or for your next corporate yacht charter. What is a Tandem Yacht Charter? With multiple families or groups with 10+ guests, our clients often opt for a tandem yacht charter, in which two or more comparable yachts charter together. Our popular BVI yacht charters offer an abundance of ideal yachts and crews for these charters. Our select crews will design itineraries, activities, and menus that will cater to the entire tandem group. What are the benefits of a tandem yacht charter? The majority of our crewed yachts feature 3 to 5 guest cabin layouts, making a flotilla of similar yachts an ideal way to cater to larger groups. By breaking larger groups among multiple yachts, the guest to crew ratio is decreased allowing the service level to increase. Our crewed yachts feature at least a Captain & Chef, with our larger or higher-end options featuring additional crew members. With an abundance of identical or nearly identical yachts within the fleet, we can easily pair several yachts together in tandem, each with similar levels of amenities, water sports, cuisine, and crew mind-set. Tandem yachts and their crews will sail together, anchor close to one another, and plan some casual group get-togethers throughout the charter. Guests can enjoy the best of both words, including a more intimate setting aboard their own private yacht plus the entire tandem group during planned yacht gatherings. Yachts typically offer happy hour get-togethers, group outings or excursions, plus various pre-approved dining options, such as adult meals on one yacht and kids meals on the other yachts on select days. In Search of a Corporate Yacht Charter? Look no further than Carefree Yacht Charters. Based on the size of the group, one of our mid-range to high-end yachts or one of our tandem yacht charters is an ideal way to reward superior efforts. Our crewed charters also allow for business gatherings and professional development in an extraordinary setting with plenty of adventure and fun in the mix. I have to tell you what an amazing vacation our trip was. It was more than I could ever imagine. From the spacious, clean and quite enjoyable yachts, to our amazing crews, the only word that describes the trip is ""PERFECT"". I cannot to you how much I appreciate all you did to ensure every point was covered prior to our trip. You couldn't have picked more fitting crews for our group. We are all still talking about the trip, and several of us have already spoke with friends that will be contacting you in the future. Again, thank you so much for all you did for our best vacation yet! Ask us about our dinner and stay aboard at the May, 2018 BVI Charter Yacht Show! Winner of Best in Show at November, 2017 BVI Charter Yacht Show! Able to accommodate up to 14 guests in tandem with Dolphin Splash, 2 great yachts, same owner with 4 designated crew members, 3 Dive Masters, flexible tandem options! Able to accommodate up to 14 guests in tandem with Slivochka, 2 great yachts, same owner with 4 designated crew members, 3 Dive Masters, flexible tandem options! Consider a tandem charter in the Virgin Islands, including our popular BVI yacht charters. Or consider a charter in the St. Maarten area or the Grenadines, each offering a slightly different flair. Enjoy the islands aboard one of our popular catamarans, monohull sailboats and luxury motor yachts. Learn more about our various yacht styles. Personalized and private, embark on the vacation of a lifetime! Learn more about what these crewed charters offer.